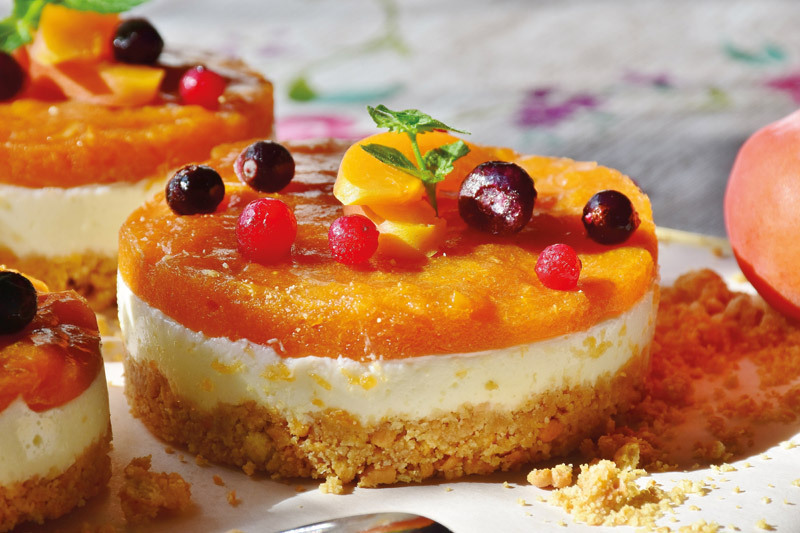 Light but indulgent, these creamy individual fruity cheesecakes make for a naughty but nice way to finish an evening meal. Place four 9cm ring moulds on a baking tray lined with baking paper. Mix together the crushed biscuits and butter and divide between the ring moulds, pressing down firmly with the back of a teaspoon. Chill for 30 minutes. Place the orange juice in a small heatproof bowl and sprinkle over the gelatine. Microwave on the high setting for 30 seconds then stir until the gelatine has dissolved. Cool for 5 minutes. Place the soft cheese in a bowl and beat in the orange zest and caster sugar until smooth. Gently fold in the cooled liquid gelatine followed by the whipped cream. Spoon into the moulds and level the surface. Chill for 3-4 hours. To make the topping, place the apricots and orange juice in a small pan and simmer for 5-10 minutes until the apricots are softened and nearly all the liquid has evaporated. Leave to cool, then process with a stick blender to make a smooth thick puree. Spread the apricot topping gently over the set cheesecakes and return to the fridge for at least 2 hours. To serve, run a knife around the edge of each mould and gently lift away. Serve decorated with sliced apricots, berries and mint sprigs. No ring moulds, no problem: If you don’t have ring moulds then use small individual ramekin dishes or individual tartlet tins.